I started riding in the Dressage discipline in 2004. Prior to that, ever since I was a toddler, I have been horse crazy and tried to ride any horse that came in to my sight! I did not grow up with horses, as my father’s life in the Air Force required us to move every 16 months or so and we never had the finances to support a horse. With four children in the family there was no extra money and no means to provide lessons or any other equine related opportunities as we always seemed to end up living in places where there just weren’t any horses. My very first big purchase upon graduating from High School and after starting my first job, was my first horse! Yes, the horse won out over a car and I took the bus to work. That first horse took me from trail riding to gymkhana to Pony Club to Eventing in less than a year. I learned a lot about Dressage from competing in Eventing and lessons with the Pony Club instructors. 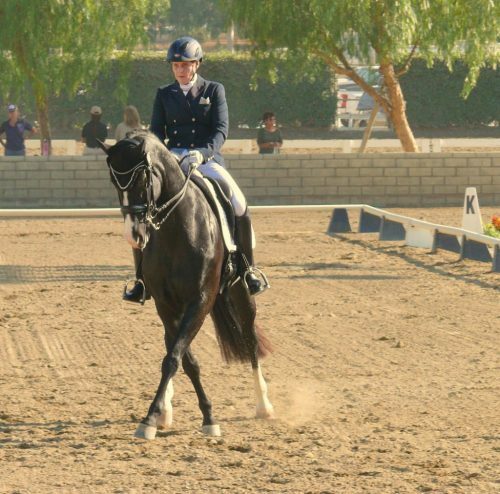 Dressage in and of itself has been my long term inspiration. Learning to ride better, train better and understand my partner (my horse) better are all the inspiration I have needed. I actually work two jobs, my full time day job is as a Tax Accounting with an LED Manufacturing company. My second part-time job is helping out the Water Company in a community that I previously lived in. I don’t have a lot of spare time as a result of my work and so every minute with my horse is very precious. After not having owned or ridden a horse for 14 years, I was so fortunate to find PEC Womanizer, my first real Dressage horse, in 2004 and now Wyleigh. I rode Womi from Training through Grand Prix levels with the help of Tracey Lert and Dirk Glitz, and I have ridden Wyleigh (purchased in Utero) from the end of her 4 year old year up to this year during which we have had a super successful year finishing at PSG level. 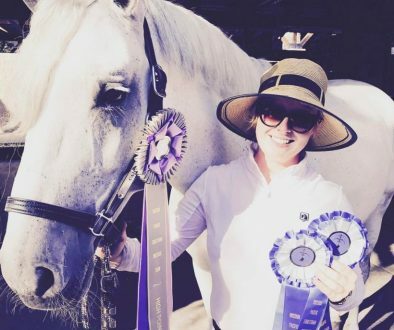 With both horses I have won multiple Regional USDF HOY and CDS (California Dressage Society) Championships as well as 30-USDF HOY Year-end Awards and 8-All Breeds Awards for Womi, 11- USDF HOY Year-end Awards, 6-All Breeds Awards for Wyleigh. What I value so much from these two horses is their trainability and partnership. The success I have achieved is in the relationships developed with each horse that came through when we performed together. There are a few moments in training that stand out over time. The first was being told to push my hands forward into the connection while I was really struggling to first learn the basics of Second level and elevate my horse’s wither, especially in front of the saddle. Those words still echo in my mind every day because the concept is universal in all levels of riding. 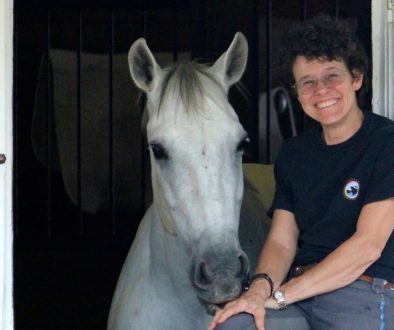 The second was when I started riding Wyleigh and I needed to understand that a young horse must be ridden forward in a way that doesn’t hurry them but helps them engage their hind quarters and allow them a door to go through. 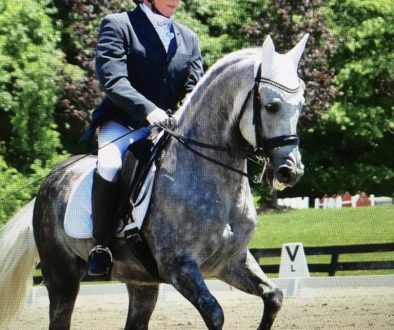 Besides the struggle to finance the darn effort, Dressage really is an ongoing challenge because just like me, my horse has her daily changes both physically and emotionally. I am always tasked with trying to identify as quickly as I can what I am riding today and focus my efforts on getting in sync/harmony with the horse I have under me in that moment. I have been very lucky to work with trainers who have influenced me in my journey, Dirk and Katrin Glitz, Tracey Lert, Jane Weatherwax and Arthur Kottas. Each one has shared their own unique experiences and talents and furthered me along the road to where I am now. I look forward to many more years of working with and learning from them. In addition to the two horses, my husband and I share our home with 4 dogs. Jake is a Red-tri full sized Australian Shepherd, Watson is a Black-tri Mini Aussie, Zack is a Blue-merle Mini Aussie and Moriarty is a Red-tri Mini Aussie. The house is always in motion between myself and the pups! I don’t have much spare time for anything but family, work and Wyleigh, but I am trying to successfully complete the “r” Judge training, including the Apprenticeship Judging, so that when I have an open weekend, I might get a chance to do some judging and give back to the sport that has given me so much. Participating in Part 1 of the L Program is a great learning opportunity for anyone to audit and I highly recommend this. Going on further in a Judge’s education is also a great idea, but requires a bit more time and effort. I guess that doesn’t really qualify for “outside of horses” though…so I do try to get hiking and camping time with my husband and dogs. Dressage is a discipline, no question about it. It requires a lot of physical ability, mental energy and communication skills. It also requires a lot of empathy for the horse. As a person who wants to be good at this discipline, I try to start every ride being grateful that I have this opportunity, value every minute in the saddle and ride the best I can, keeping in mind that I am only human and I am striving for harmony as well as development with my horse.